As a club, Barnsley FC, can’t compete in merits with the biggest club, but has a record of having played over 70 seasons in the second division (the second top league). Barnsley has several nicknames: The Reds, The Colliers and especially The Tykes. 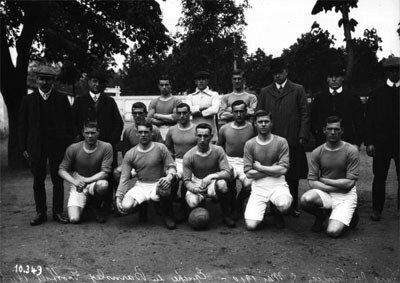 Barnsley FC on tour in France in 1910. The club was founded in 1887 by the priest Tiverton Preedy that also gave the club its name from his own congregation, Barnsley St. Peter’s. The name would ten years later be changed to just Barnsley. Barnsley is an old club and played their first season in the Football League already in 1898. The reach their first FA Cup final in 1910 and would win the same tournament two years later against West Bromwich after replay (0-0, 1-0).